My second look at 2011 census data focusses on motor vehicle ownership rates. Is the rate of car ownership still increasing? Has the rate of car ownership dropped in any areas? The raw census data provides the number of dwellings with 0, 1, 2, 3 or 4+ motor vehicles in each geographic area. 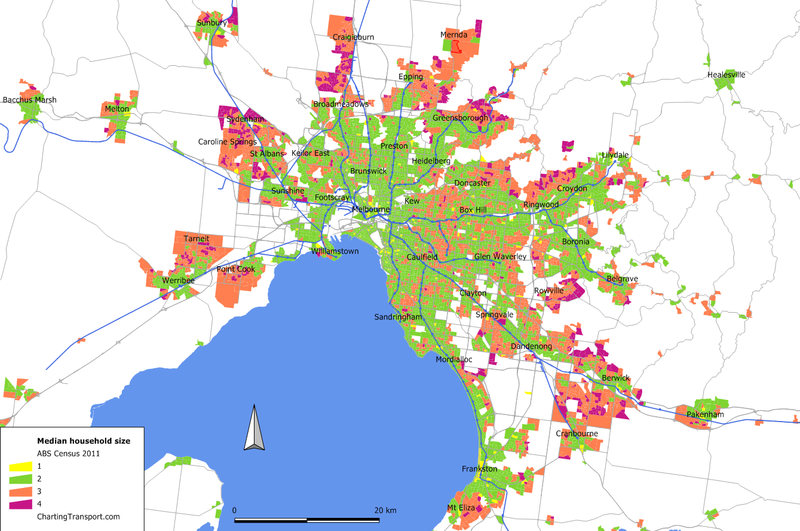 Often people draw maps showing the proportion of dwellings with 2+ motor vehicles. That is easy to do, but it ignores the number of driving aged adults likely to be in those households. 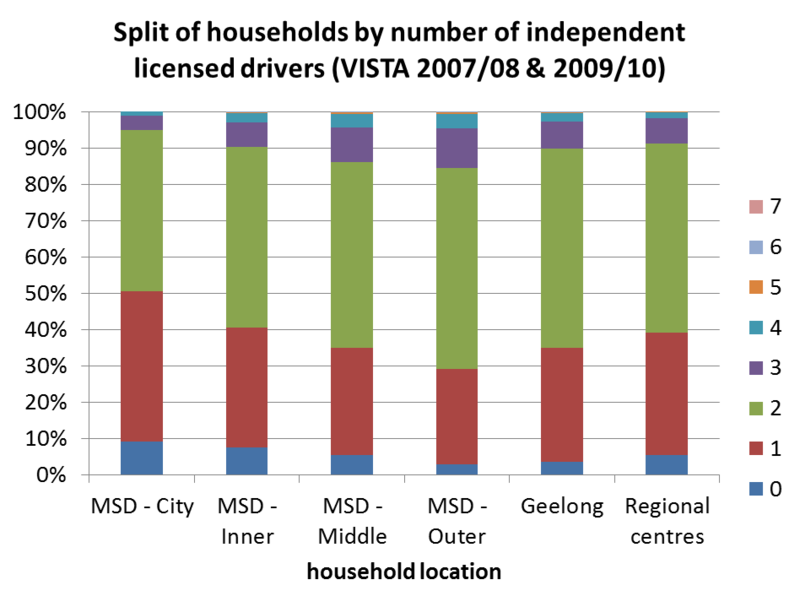 16% of households in the outer suburbs of Melbourne have 3 or more independent licensed drivers whereas the figure is only 10% in the inner suburbs. Dwellings that did not state number of motor vehicles had no motor vehicles. Dwellings that stated 4 or more motor vehicles had an average 4.3 vehicles (average figure obtained from VISTA 2007/08 and 2009/10 combined). This average could of course change over time, so there’s a slight imperfection in the calculation for around 5-6% of dwellings. I have assumed a constant 4.3 across 2006 and 2011. Driving aged population is approximated by people aged 20-74 (I used 20-74 as I only have population counts in 5 year groupings for small areas). Of course there are some people aged 20-74 who do not have a driver’s license, and there are people aged under 20 and over 74 who do have a driver’s license. See my previous post about who uses public transport for charts showing the rate of driver’s license ownership by age group. 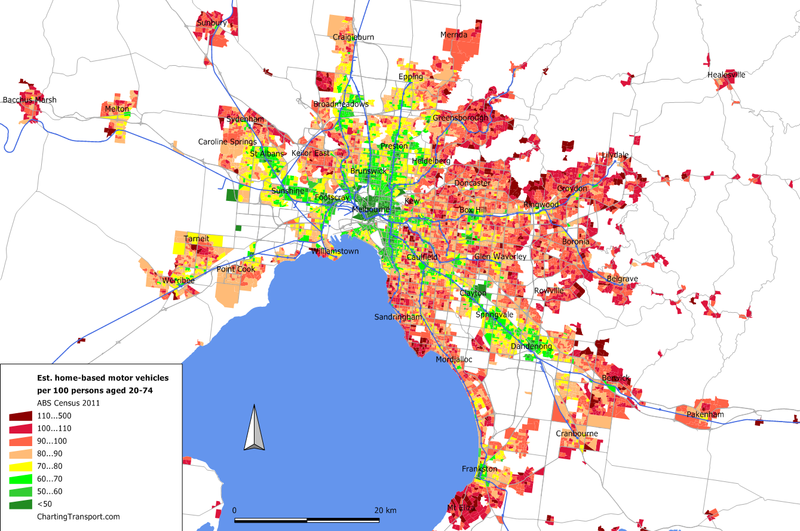 I have calculated an estimated ratio of home-based motor vehicles to the notional driving aged population for Melbourne, at smallest available geographies for 2006 and 2011 (Census Collection Districts and Statistical Area Level 1 respectively). tertiary education campuses including Clayton, Bundoora, Burwood, Glenferrie, Box Hill, Holmesglen. 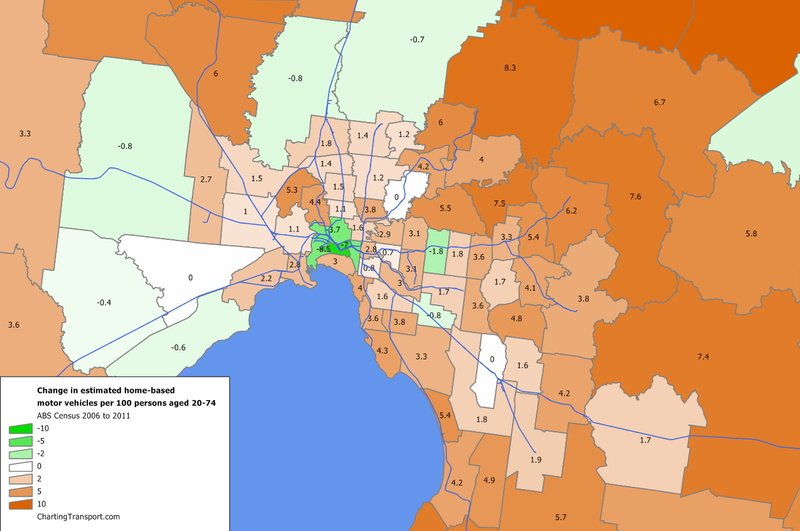 relatively wealthy middle suburbs, such as Ivanhoe, Toorak, Beaumaris, Essendon, Kew, Brighton. So how have motor vehicle ownership rates changed? You could flip back and forwards between the above two maps, but with different geographies it isn’t easy to spot all the changes. Some areas that appear to have had reductions in motor vehicle ownership rates include pockets of Werribee/Hoppers Crossing, Burwood (around the Deakin University campus), and central Frankston. Some areas that appear to have had significant increases in motor vehicle ownership rates include Mt Eliza, Doncaster, Templestowe, Williamstown, and North Ringwood. So what might explain these patterns? There has been a long term trend of increasing car ownership (refer previous post). Certainly the real cost of car ownership has been going down for some time now. Areas with large numbers of tertiary students appear to have had a decline in car ownership, perhaps reflecting successful mode shift campaigns with staff and students, and/or an influx of international students who might be less inclined to buy a car and/or drive. A growth in apartment living in the inner city, where there is less need to own a car due to high quality public transport and many destinations within walking distance. Although I note that motor vehicle ownership rates still rose in the neighbouring City of Yarra, suggesting densification a couple of suburbs out from the CBD seems to still be introducing more cars (and/or other motor vehicles). I’m really not sure why the rates of car ownership appeared to decline slightly in the outer growth areas to the west and north, but not the south-east (although the Cranbourne and Pakenham SLAs only showed relatively small increases of 1.7 and 1.9 respectively). I should point out that the decreases are very small (all less than 0.8) and probably not significant when considering the assumptions I have had to make in calculating the estimates. I’d also make the comment that increased car ownership doesn’t mean increased car use. As I’ve pointed out elsewhere on this blog, average km travelled per car has peaked in Australia, as has car passenger km per capita. analysis of motor vehicle ownership saturation in households, in my first post on who uses public transport. This entry was posted on Friday, October 12th, 2012 at 11:38 am and is filed under Car ownership, Melbourne. You can follow any responses to this entry through the RSS 2.0 feed. You can leave a response, or trackback from your own site. Janet, just quickly, the increase was an estimated 1.1 more household motor vehicles per 100 residents aged 20-74. Household income data is available: For the Maribyrnong SLA, median household income went from $932 in 2006 to $1258 in 2011, an increase of 35%, compared to all of Melbourne which went up 24% (Melbourne CPI went up 15% between the two censuses). Unfortunately I don’t have a good PT supply measuring tool. Nice maps but I would suggest a different colour scale. Red-green colour blindness is very common – hard to distinguish the negatives from the positives.